These easy to make Christmas squares are going to become a family favourite. Squares are quicker and easier to bake than cookies. And they are way easier to eat, so better hide these really well if you want any left for company! And you don’t even want to know how many grams of fat they have….remember these are a treat, eat accordingly. 1. Preheat oven to 350°F (180°C) line a 9×13-inch baking pan with parchment paper, this makes it easier to slice later. 2. In a medium bowl: stir together the chocolate cookie crumbs and oats. Add melted butter, stir until well coated. Tip into pan and press down until the cookie/oat mixture is firmly in the bottom. 3. Evenly sprinkle one of the packages of chocolate chips on top. Evenly pour the condensed milk over top chocolate chips, using the back of a metal spoon to spread it out if necessary. 4. Evenly sprinkle the toffee bits over top and then the other package of chocolate chips. And that’s it, easy peasy. 5. Place in oven and bake for 25-30 minutes. Remove, place on a wire cooling rack and let cool for at least 6 hours. When completely cooled, remove from pan and slice into 24-48 equal pieces, your call. 6. Store in an airtight container for up to 1 week or freeze for up to 2 months. Hide them until needed, because these babies are addictive…..currently freezing mine so my husband won’t eat them all. 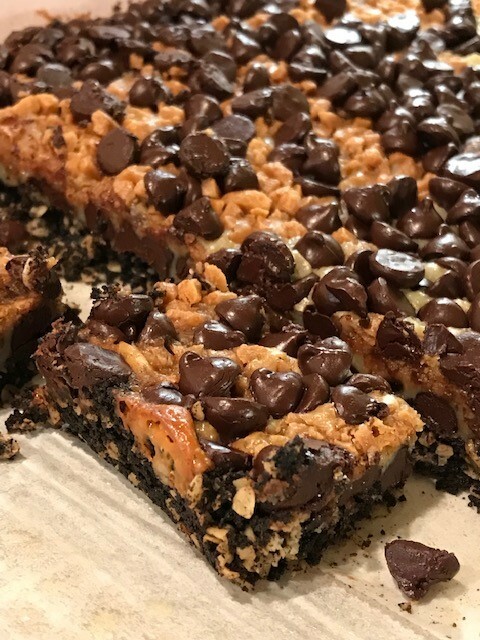 Sidebar: I adapted this recipe from a Chipits recipe and it is not an ad for them. My goodness Mrs. Smith you make me smile. I add weight just looking at your recipes however my tea and coffee making ability are the only cooking ability I can say that I am reasonably good at. Keep up the with good work and wonderful sense of humour. Hiding these will do nothing for my husband not eating them! Frozen or not he’s eating anything. Making to take to a friends place tonight. I had Heath bits so used that and had to substitute chunks for one of the packages so I think they will be even more sweet….. I made these for the holidays and they will be my new “go to” recipe ! I made your Decadent Choc. Squares this Christmas, wrapped them up and gave them as gifts…..they really were a big hit!!!. These will be on my Christmas bake list. Thank you for sharing.